A personal fondness for the melodic death metal genre can be a double-edged sword. It’s a genre that many consider dried up from fresh ideas, but an excellent rendition of the sound can easily put a smile upon this writer’s face. However, hearing so much of it also means that there has to be a certain “something” that needs to come across to warrant repeat performances. 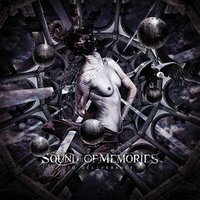 To Deliverance, French melodeathers Sound of Memories debut full-length, has its strengths and weaknesses. The vocals are harsh for the style, particularly considering the sometimes upbeat nature of the material that back them up here. It does sound reminiscent of Mors Principium Est in this regard (alongside some of the aggressive thrashy riffs that also pop up through the album). The contrast of the heavier, thrashy riffs is balanced by a more upbeat and catchy number of melodies that weave their way in. Sometimes the upbeat nature borders on folk, but it is an effective measure. The album’s best cut, “Pray for Blood” benefits from this combination of aggressive thrash riffing that builds to an absurdly catchy chorus. The biggest weakness comes by way of the “clean” vocals. Sparsely used but appear on a few tracks (“Eulogy” being the first on the album), they come off a bit In Flames-esque and would benefit from a stronger presence. There is some serious potential to be had with To Deliverance. Some stronger clean vocals would be aces, but don’t let that steer you clear from the album. While it’s always beneficial to deviate from the melodic death formula, the strength of the melodies and intensity of the riffs is there. We’ll see where they take if from here.